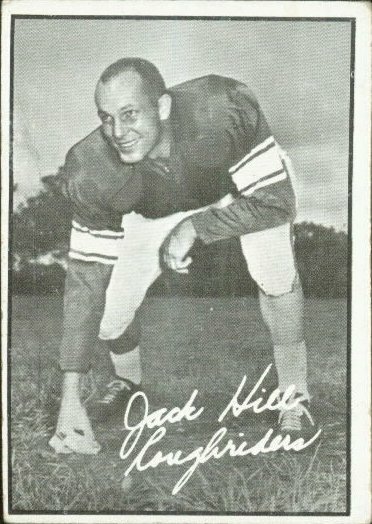 Jill played five years with the Saskatchewan Roughriders from 1957 to 1961. In his first season, Hill was used as a running back with 111 carries for 542 yeards. After 1957, Hill was used mainly as a receiver, as well as doing some of the kicking. 1958 was Hill's big season as he led the West in receiving with 60 catches for 1065 yards. Hill was named a West All-Star in 1958, ironically as a running back though he had only 14 carries for 33 yards. Hill is listed in the Rider all-time roster for 1957-61, but does not appear in the stats. No game participation stats were kept in the Westg until 1964.